I know I have complained a bit about so many of the 100 Best Novels being so similar. I know there is some truth to that, but #56 proved they do not all fall in the same genre. 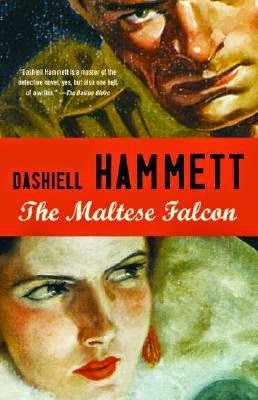 Dashiell Hammett's The Maltese Falcon involves no lonely British women and no colonized countries...well, assuming you're not counting America. We haven't been under British rule for quite a while now, after all. Hammett's mystery is one I knew about before starting the challenge. I could not have told you any of the plot or named a single character, but I did at least know it existed. The story, as it turns out, is set in San Francisco and is one of the first true detective novels. The protagonist, private investigator Sam Spade, takes on a case without realizing its full scope. Suddenly, he finds himself embroiled in an international escapade with his life on the line. Sounds like a lot of modern thrillers, right? I was a drama nerd in high school. Well, to be technical, my loyalties were split between choir and theatre. I was president of my choir and lead in the school musical my senior year. Rehearsals, concerts, and performances. My whole life revolved around them. I even got my first kiss on stage. Most embarrassing moment of my entire life, and yet one of my favorite high school memories as well. I'm telling you....I was 100% committed. That being said, you can understand why I snagged a copy of Michael Sokolove's Drama High when I had a chance. 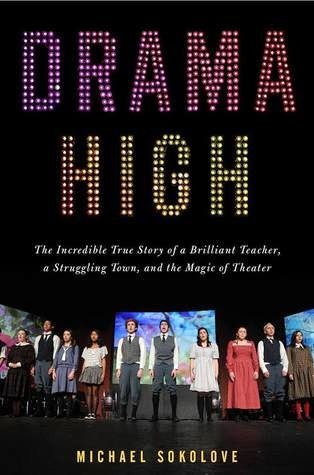 The nonfiction book tells the story of one of the finest high school theatre programs in the country, led by the venerable Lou Volpe. Truman High, which lies in a small, struggling New Jersey town, has become renown for their high quality productions. The school premiered the high school versions of Les Misérables, Rent, and Spring Awakening, all under Volpe's direction. Sokolove attended the school back in Volpe's early days, when he was only an English teacher involved in the theatre program on the side. Things have changed drastically since those days and, now, Volpe teaches a full curriculum of theatre classes in addition to guiding young actors through notoriously tough material. I absolutely loved reading about the program and the people involved in it. The story, at its core, is about the people, not the program, but the theatre bent certainly made it more interesting and relatable for me. I have to admit...I am currently halfway through Howard's End and keep getting it confused with A Room With a View in my mind. As I sit down to write this post, I am actively working to separate the two novels mentally. A consequence of this challenge, I suppose. 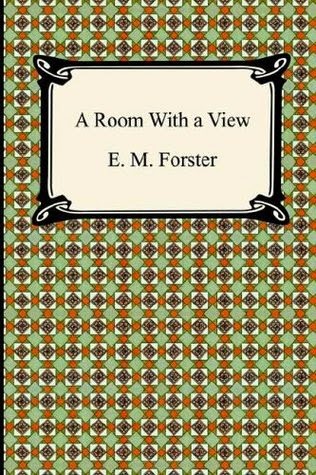 The funny thing is, I found E. M. Forster's A Room With a View quite charming. It doesn't deserve to get confused with another novel. Yet, as I have mentioned before, some of these Modern Library picks run together a bit. So many are set in this turn-of-the-century British world. Good thing I like that world a lot, but still. I would love to see some more diversity on the list! A Room With a View tells the story of Lucy Honeychurch. It starts out in Florence, Italy, where Lucy is traveling with her cousin Charlotte. She meets a young man, George Emerson, and his father. They have several interactions, culminating in a stolen kiss witnessed by a mortified Charlotte. Lucy is then whisked away back to England and the secret is kept. Make sure you read to the end of the post today! I'm giving away a copy of Ruth Reichl's debut novel! When I was in Florida last month, I knew I was going to need some good beach reads. After all, no one wants to read James Joyce while relaxing in the sun. It just doesn't fit. 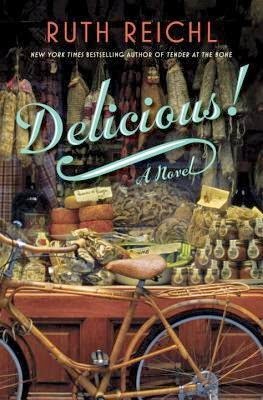 Thankfully, I had just gotten my copy of Ruth Reichl's debut novel, Delicious!, in the mail from TLC Book Tours. It seemed like a good option, so into the bag it went for a little trip to West Palm Beach. I have had Reichl's first memoir, Tender at the Bone, On Reserve for ages. It's one of those food memoirs that I simple have not gotten around to yet. I have a lot of them on my list and you have to spread these things out, you know! When TLC offered me a chance to read Reichl's first fiction work, I knew I could not pass up the opportunity. It seemed like a great way to get an introduction to Reichl's work. The novel centers around a young woman, Billie Breslin, working in New York City. She lands a job at Delicious!, a food magazine, as an assistant. Her new colleagues and friends all love food and the book is rife with descriptions of tasty treats. Billie, however, is holding her personal history and abilities close to the chest. She has incredible talent, but personal tragedy holds her back from fully realizing it. Another grad school pick coming your way today. It's a good one, I promise! I have had a different Geraldine Brooks novel On Reserve since Will Schwalbe mentioned it in his memoir The End of Your Life Book Club. 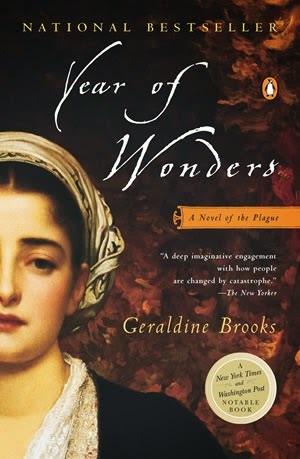 Because of that, I was pleased to find Year of Wonders on my required reading list for my Interdisciplinary Liberal Arts course. I figured if Brooks had written one winner, chances were decently good for another. Year of Wonders was actually Brooks' first published novel. It became an international best seller and both the New York Times and Washington Post have honored it. And for good reason. The historical fiction novel takes readers back to the 17th century Plague in Britain. The protagonist, Anna Frith, lives in a small village with her two young sons. Her husband passed away in a mining accident, so she supports her family by serving as a housemaid for the local rector and his wife, Michael and Elinor Mompellion. Anna also takes in boarders in her small home. This source of income, tragically, sets the story moving. A renting tailor catches Plague, presumably from the London cloth he receives for his work. As the epicenter of rippling water, the disease spreads from there. If you've been a regular reader this year, you know Kevin and I have been slowly working our way through the incomparable Harry Potter series. For the most part, we only do audio books when we are traveling, so a trip to Michigan for Easter proved the perfect opportunity to finish up the third tome. Rowling definitely improves with each book, diving deeper into characters and the consequences of good vs. evil. 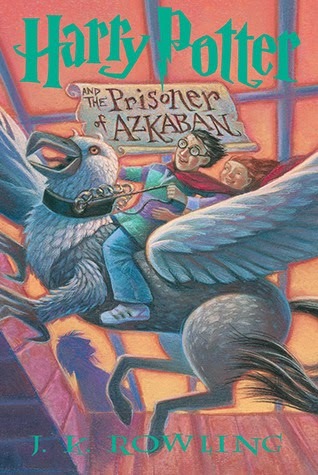 Still, to me, Prisoner of Azkaban falls in line with the first two books. The trio feel much more like a children's series than the deep story they develop into. That progression either shows a growing writer or growing characters. Probably both. In Azkaban, Harry begins to learn even more about his real history. Lupin and Black are able to give him a much more clear picture of his parents and help prepare him for the fight ahead.